ORCAweb is an innovative, content rich web server application that allows facility managers, service personnel, and building tenants access to the building automation system with a simple web browser application. The level of access to the building automation system can be customized for a specific user. ORCAweb is designed for small, medium and large sized facilities that need the ability to distribute building systems information to multiple facility staff or tenants. ORCAweb can be utilized on any type of building including a large university campus or small office buildings. Custom system graphics allow facility managers to operate their building easily and efficiently by monitoring equipment status, alarms or adjusting setpoints and schedules. Facility managers and service personnel can view system graphics and configuration objects, while tenants can view specific data via the Tenant Portal or Virtual Stat™. Tenant Portals allow each tenant to view a customized web page that displays the current status of mechanical, lighting, and access systems that serve their office area. 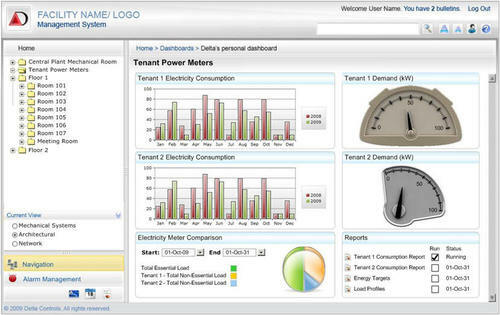 Tenants can easily set their own occupancy schedule and holidays to maximize the energy efficiency of these systems.